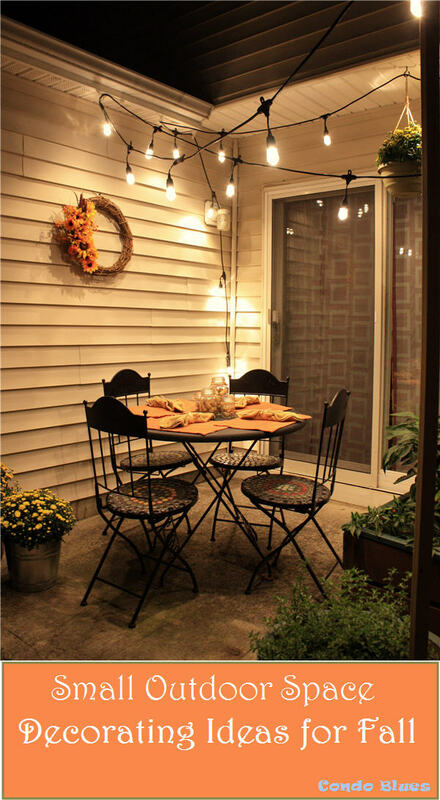 I want to make our small patio more inviting for evening entertaining this fall. 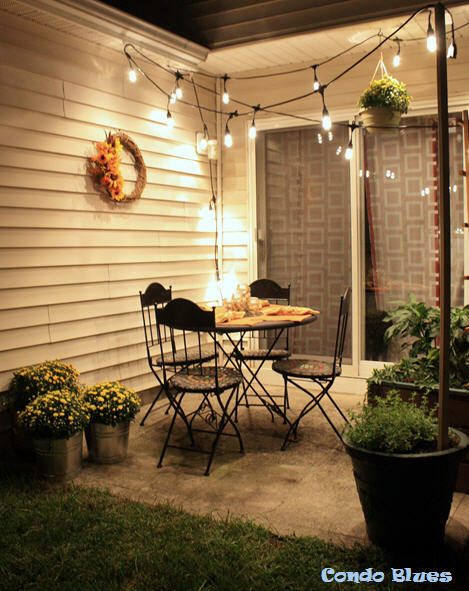 Pin these Fall outdoor decorating ideas for later! The planter box I built for Husband’s container kitchen garden adds a little privacy since our condo homeowners association will not allow us to install a fence. And we get fresh herbs and peppers, yay! Functional and not fun condo patio BEFORE. I moved the grill to make room for my DIY bottle cap mosaic patio chairs and chalkboard patio table and have some ideas for cute small space fall outdoor décor. The only problem is my backyard is so dark at night it is practically unusable. 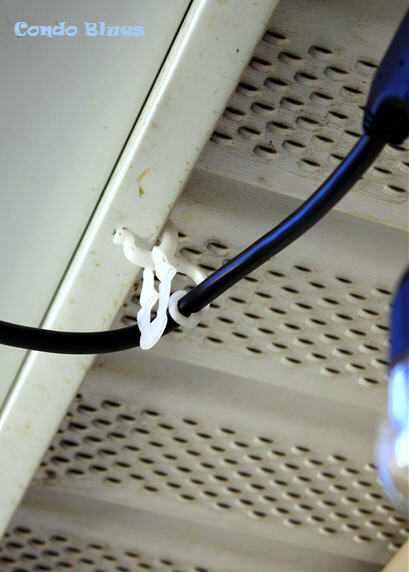 Fortunately there is a solution for that – lights! Specifically Enbrighten Café Lights by Jasco. These heavy duty LED wonders light up our patio so much it looks like an outdoor café. I haven’t retouched any of the photos in this post. I took these photos at nine o'clock at night. Enbrighten Café Lights are really this bright. Project Manager Lacey peeks from behind the curtain to keep an eye on me. Enbrighten Café Lights are made to stay outside in all four seasons but I didn't want to put holes in the house to hang the lights. I hung ours from the house soffit using outdoor Christmas light clip on hangers (affiliate link for your convenience) instead of hanging them on hooks or screws. Mission accomplished! It also made me put "rent power washer" on next Spring's To Do List. So dirty! 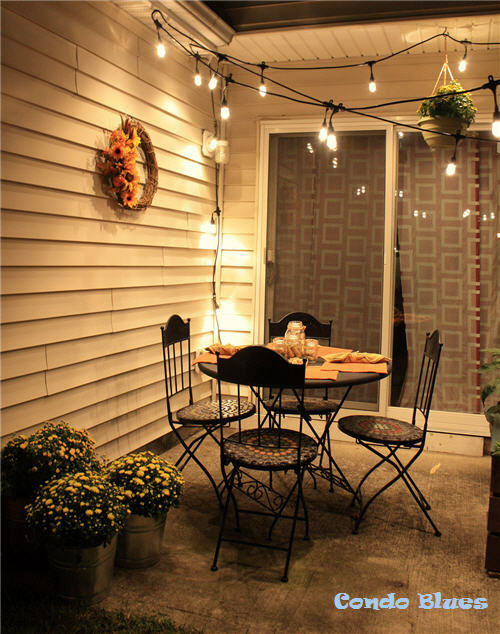 To get the bistro light zig zag look without a pergola or fence, I wrapped the string lights around the planter trellis and hung the last string on a wood pole with a nail driven into the top that I sunk into a potted plant. I put the lights on a TouchSmart Timer. That way they come on at night and turn off automatically to save electricity - and time. Time to decorate the rest of this tiny patio for autumn! 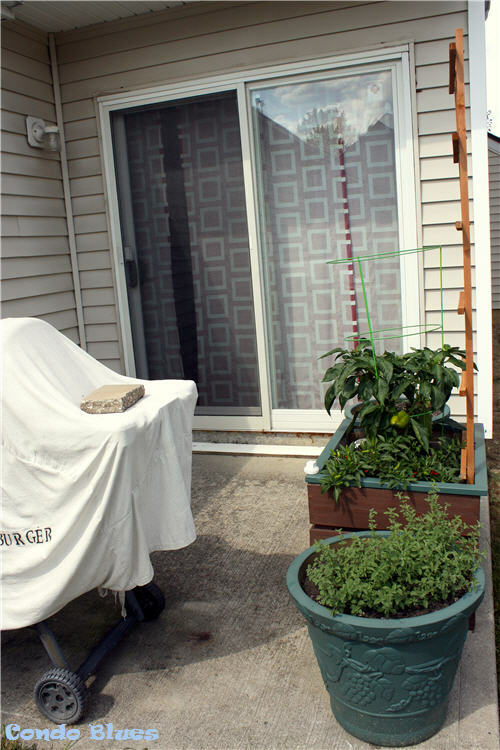 I bought fall mums and upgraded their sad plastic pots by popping the plants – sad pot and all – into two galvanized buckets I bought for a past project but did not use, a hanging planter, and a big metal planter I scored at the thrift store for 8 bucks. I used a coffee can paint raiser from the garage to make the small potted plant fit in my big planter. 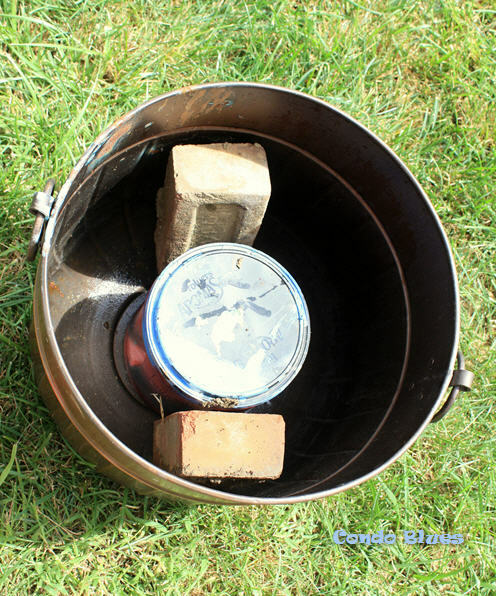 The bricks add weight to steady the planter so it doesn't flop over. I hung my DIY fall flower wreath on the wall for visual balance. I scored all of the materials to make the outdoor autumn wreath for 6 bucks at the thrift store. Keeping it cute and green! I made a mason jar and wine cork centerpiece for ambient light. 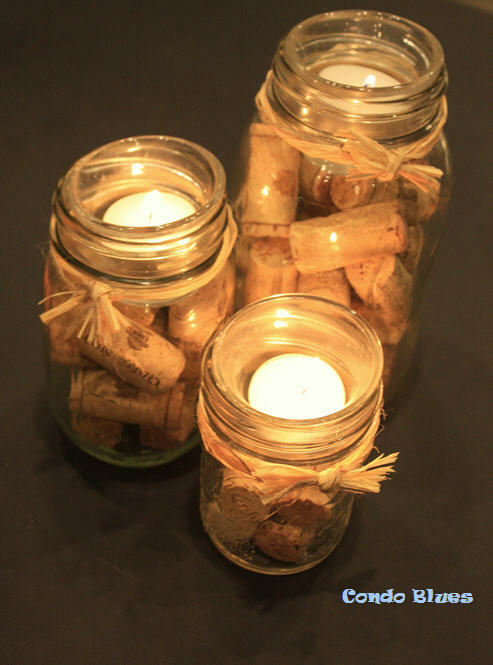 I’ll teach you how I made my wine cork and mason jar candle holders in a future post! 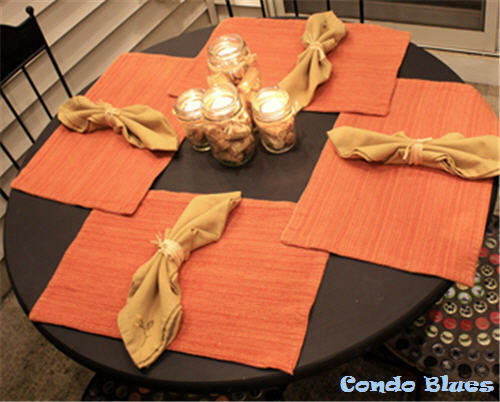 Lastly, I added orange place mats and wrapped raffia around my fall linen napkins to set the table. Let's hear it for shopping the house! Finally, I did a happy dance in the backyard because I love how the Enbrighten LED lights are so much brighter than the solar string lights we hung at the beginning of the summer! Husband laughed at me because I go completely nutso for lighting. 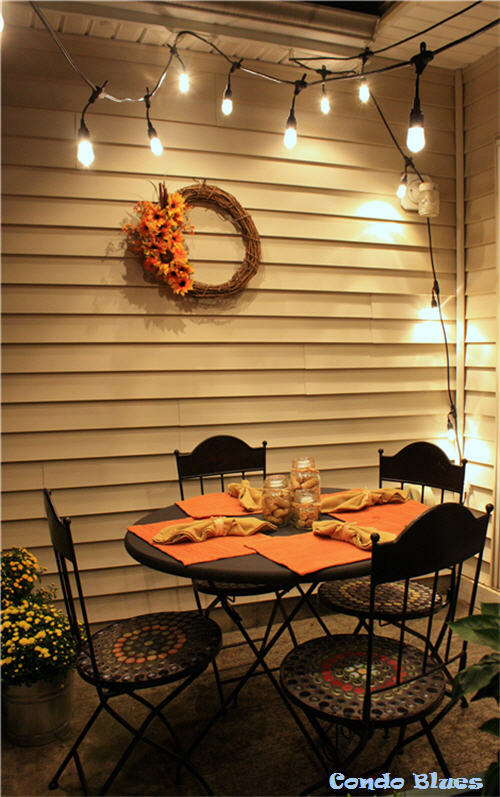 The Enbrighten Café Lights make our little condo patio décor feel posh! I can sit outside and read a book by the light of the Enbrighten Café Lights. I can’t do that with our weak solar string lights.